Over the course of our nation's military history, tens of thousands of War Dogs served during WWI, WWII, the Korean Conflict, Vietnam, the Persian Gulf, Bosnia, Iraq, Afghanistan and continue to serve our missions around the globe. America's War Dogs have a long and legendary history for bravery and courage on thousands of unnamed foreign fields of battle, saving countless American lives. Some military analysts estimate as many as ten thousand U.S. and allied lives were saved during the Vietnam War alone. The casualty rates in all other wars were significantly reduced by thousands as a result of deploying our four-legged soldiers! These animals performed specialty duties as Scout, Sentry, Tracker, Mine & Booby Trap, Tunnel, Water Patrol, Coast Guard, Search & Rescue, and Explosive Detection. 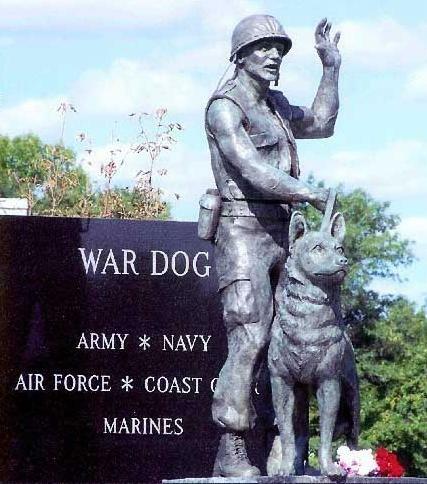 Our War Dogs were not mascots, they were highly trained and proficient four-legged Soldiers, Marines, Airmen and Sailors with names like Prince, Tiger, and Lucky, to name a few. Our War Dogs worked for food, water, and the love and companionship of their handlers. In return, our War Dogs never gave up on the battlefield. They were heroes! Of the approximately four-thousand War Dogs that served our Armed Forces during the Vietnam War, all were classified as equipment and termed expendable! Roughly two-hundred and fifty were re-assigned to another military installation. The several thousand surviving heroes were either given to the South Vietnamese Army or euthanized, by order of government, in a haste to withdraw from the country. Here in Bristol Township, your community, we have completed our own Pennsylvania State Memorial to honor these four-legged heroes. The memorial is located in front of the Bristol Township Municipal Building located at 2501 Bath Road, Bristol, PA 19007.